The Invictus Games – held recently in Sydney – is an international multi-sport event, in which wounded, injured or sick armed services personnel and their associated veterans take part in sports. A considerable proportion of the athletes had reported symptoms, if not the diagnosis, of Post-Traumatic Stress Disorder, which is characterized by feelings of panic and extreme fear following a traumatic event. While this is oftentimes accompanied by chronic and clinical levels of distress, comorbid emotional problems, and general interference to daily functioning, we cannot overlook the tenacity demonstrated by those with post-traumatic stress, which captures the essence of the Invictus spirit – “Unconquered, Invincible” in Latin – on or off the sporting field. The women’s 50m freestyle event, in which 41 year old novice Sarah Robinson and 32 year old relative veteran Poppy Pawsey participated, epitomizes this spirit. Robinson was an army reservist sergeant who proclaimed to be the “top in my field – a feisty girl who feared nothing and no one”, however the onset of anxiety had led to a great struggle with basic functioning as she reportedly withdrew from relationships and into the confines of her home. And Pawsey, formerly part of the Royal Marines but later discharged because of musculoskeletal illness, had likewise reported experiences with emotional difficulties that had once debilitated her. Robinson states in a post-race interview: “That’s the whole thing about the Invictus Games. It doesn’t matter where you come. Yeah I came last, to be honest my goal was to just finish at all. Not be fished out of the pool, not panic. My teammate Poppy who swam back for me, she knows that because we’ve trained together for so long. So she knows my issues, she knows that I have a tendency to panic in the water. But everybody surrounds you, they don’t judge you, they’re there for you, they support you. It’s amazing. I honestly didn’t think I was going to finish.” Presenter and journalist Richard Glover affirms this, with the response that he has seen many events at the Sydney Olympic pool, however this was in his opinion “the best thing I have ever seen”. In addition to witnessing the raw humanity and camaraderie between the competitors, I was also inspired by the ways in which resilience is exemplified. Decades of research on resilience has culminated to this definition: An individual’s or group’s process of continual development of personal competence while negotiating available resources in the face of adversity (Worsley, 2010). According to this model of resilience, the ‘resources’ component of the definition pertains to the 7 external factors of one’s life in which resilience can be developed, illustrated in the outer circle. 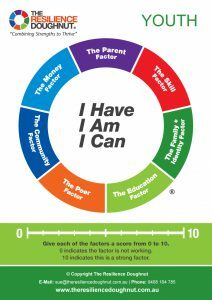 The ‘competence’ component of the definition is conceptualized as the internal factors of one’s life – which comprises of awareness of one’s relationships (I Have), identity (I Am) and capacities (I Can) – illustrated in the tripartite inner circle of the model. Robinson connected to her strongest external factors (which thus far seem to include – but may not be exclusive to – Partner, Family & Identity, Friends, Community, Skill), even though anxiety had initially disrupted such connections. Not only did she connect to her strong factors, but she combined these strengths in practical ways on a continual basis – for example making a 60 mile commute to train (Skill and Community factors) with her training partner/s including Pawsey (Friends factor), and with the support of her loved ones (Partner and Family & Identity factors). 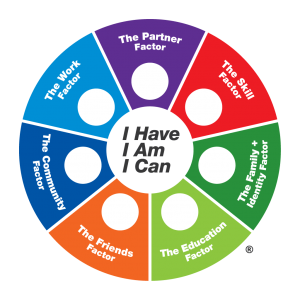 Through connecting with the external factors of her life in meaningful ways, she became aware of, and had continued to develop understanding of the internal factors that drive her: who supports her (I Have), how she sees herself (I Am), and her confidence in her own abilities (I Can). “I want to get my identity back – the soldier, the professional, the competitor, the mother. I was someone who was top in her field, but I can’t seem to claw my way back. I need my fight back and make my partner Aaron and my daughters proud of me. Through sport and new challenges I know I can push myself to achieve and change my path for the better”. She did not define success by the conventional means of being better than others with a leading time and rank, but rather with becoming a better version of herself, and in doing so leading others by example. 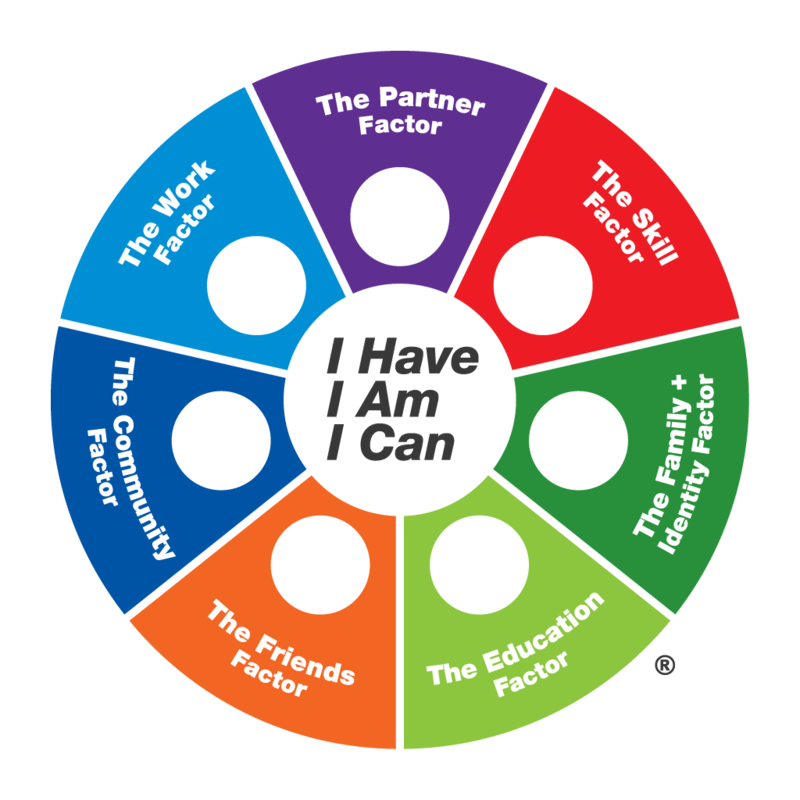 The interactions between the internal and external factors are bidirectional yet compounding: Robinson’s utilization of her strong factors had enhanced sense of self, which in turn allowed her to continue with connecting with her factors in more effective ways. As she connected and combined her factors in more effective ways, it further developed a healthy sense of self, which then had better equipped her to thrive through and beyond adversity. She was realistic in acknowledging the adversity she had experienced, however she refused to be defined by it, instead effectively inoculating herself against it with a combination of her resources and competence, and intentionally using the Invictus Games as a platform to push through the barriers that had once confined her. And she was a success, not because of her adversity, but in spite of it. Past research has focused on the link between the individual’s risk factors and negative life outcomes, and how such vulnerabilities are inversely correlated with resilience. There has been, however, an increasing shift in focus from such risk factors to protective factors and positive prognostic factors, in ways that honour the individual and his/ her agency. Robinson may have finished with last place in her heat, as she openly states, however her resilience and optimistic spirit have surely secured a position in the hearts of many viewers as a good sport and a fit role model. What are your best hopes, the metaphorical finish line? What are you already doing that is helpful in progressing towards your best hopes? What does this reflect about your strengths, values and abilities? How has past adversity enriched you, your life and/or your development? How can your current adversity further enrich you, your life and/or your development? Sarah Robinson came last in the Women's 50m Freestyle. Despite this, her race was easily one of the most beautiful moments at the Invictus Games 2018!